Overweight? Big Boned? How’s A Dog Owner to Know? How many times have you heard those words or uttered them yourself? No one wants to believe his or her canine companion is overweight or obese. But according to the Association for Pet Obesity Prevention (APOP), in 2015 veterinarians identified an estimated 54 percent of U.S. dogs as overweight or obese. To make matters worse, many dog owners don’t realize they have a pudgy pooch. During its 2014 survey, APOP found 95 percent of owners of overweight dogs incorrectly identified their pet as being at a normal weight. Why the perception gap? Some dog owners may be in denial about their pet’s size. Or it’s possible some pet parents have trouble recognizing what’s an appropriate weight for their four-legged family member. Regardless of the reason, the difference in veterinarians’ and pet parents’ perceptions makes an already weighty subject that much more difficult for veterinary teams to address. Figuring out your dog’s ideal weight can be difficult. You can refer to breed standards — assuming the official breed standard includes a weight range — but you’ll also need to consider your dog’s age, gender, height and body build. 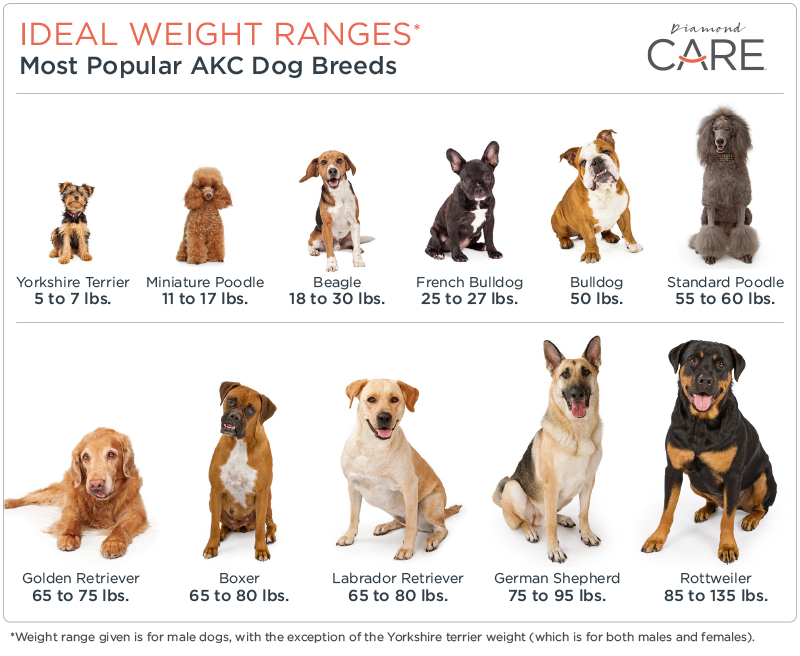 Your veterinarian tracks your dog’s body weight from one examination to the next, but knows the number on the scale doesn’t really tell if your dog is at an ideal weight for him or her. Can you easily feel your dog’s ribs? Run your hands along your dog’s sides as if you’re petting him or her. If you can feel their ribs using only slight pressure, your pooch is likely at an ideal weight. But if you need to apply pressure to feel the ribs, then your dog is likely overweight or worse. Does your dog have an easily identifiable “waist”? When you look down from above your dog, do you see an hourglass shape with a waist between his or her abdomen and hip joints? Does their belly slope upward from the ribs to the back legs when you look from the side? If your pup looks like a hot dog, chances are they are overweight. Is your pet’s back flat? Can you see or feel “love handles” over the hips or top of the tail? Overweight or obese pets may look like they have a wider-than-normal back, and fat stores over the hips or tail head can be obvious. If you think you could use your dog’s back for a table or ottoman, they are most likely overweight. If you suspect your dog may be overweight, you’ve taken an important first step toward addressing the problem: recognition. However, your veterinarian needs to be part of the solution. Your veterinarian can create an appropriate nutrition and exercise program to help your canine companion achieve their ideal weight and body condition. And members of the veterinary team can provide support and encouragement along your dog’s weight loss journey (if one is necessary). Your veterinarian may recommend feeding a specifically formulated dog food to help your four-legged friend lose weight safely. That’s because weight management diets are designed to provide all of the nutrients a dog needs while reducing the number of calories eaten. Diamond CARE Weight Management Formula for Adult Dogs is one such diet that can help address your canine companion’s weight issues. You can learn more about this new dog food by visiting the product information page. Remember, it’s not too late to help your best friend live a healthier, more active life.